There is an importance of sacred ritual and ceremony. As a floral and event designer for weddings and special events, I am seeing a reoccurring trend in the exclusion of ceremony décor from the overall floral budget. Over time, couples seem to continue reducing their investment both personally and financially into the actual ceremony. Now I can understand from a bride’s perspective how this can make sense. Your wedding ceremony is usually only 20-30 minutes long, while the majority of the time is spent at the dinner and reception. However, as couples stand before their ministers, officiants, family, and friends, (and let’s not forget God) declaring their lifelong devotion to one another, could it be that we are missing the point and not focusing our attention to these ceremonial details? There is a significance to the ritual, hence why it is called the ceremony, and it is human nature to mark special events. This is an opportunity for inclusion, acknowledgement, and creation, not only reflecting the dedication you are making to your partner but the merging of two families becoming one. It’s time we give proper attention and commitment back to what I believe is THE most important part of the wedding day. you are willing to give to your ceremony. 1. Determine the depth and scope of the ceremony. How do you plan to reveal yourselves to each other? 2. What is your comfort level in expressing and committing yourself in front of your family and friends? 3. Are you including any significant family members in the ritual of uniting two families as one? Making a lifelong commitment in front of others is so much more than just a celebration. It’s what marriage and partnership are all about. While some couples find it hard to expose themselves and their affections in front of others, I urge you to reconsider and suggest that you stretch yourself, perhaps further than you ever have before. This is the beginning of your vow to one another and going the distance reveals the importance and power of your love. 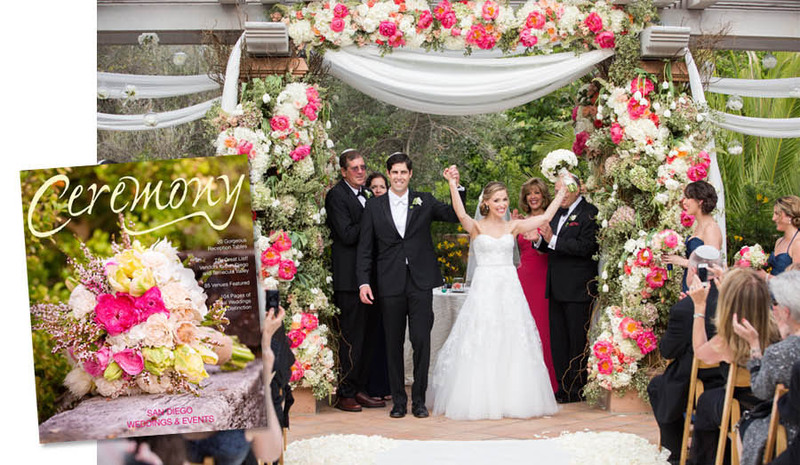 In our INTIMATE SPRING WEDDING the focus of decoration was in the ceremony aisle and site location. When I say intimate, this beautiful celebration was just the immediate family of four, but the attention to detail proved just how special this union and ceremony meant to them. From lining the aisle with thousands of white rose petals and creating a streaming cascade of hanging orchids, this couple not only chose an elaborate private set-up but decided to recreate their ceremony décor the next week for their reception guests. What I love about this story is that it was most important for these two to be surrounded by purity and loveliness during the moments that mattered most to them. We’ve worked with brides and grooms who have personalized their ceremony to fit their beliefs with religious rituals that unite them in their own spiritual style. Many Southern Californian beach weddings incorporate a hand-washing ceremony which represents complete forgiveness in recognition of everything an individual experiences up to the moment they stand before one another and commit their lives to love. The hand-tying (or handfasting) ceremony, which was part of the SACRED ELEMENTS WEDDING, paid homage to the bride’s Celtic heritage by binding the hands of the couple with ribbon to symbolize “tying the knot.” This, along with the groom’s Native American Indian roots, acknowledged the sacred rituals special to them as a couple so they could honor the four directional compass points. Their ceremony site was enclosed within a five point floral canopy, which represented the five elements of earth, air, fire, water and spirit. While the hand-tying ceremony commenced, the couple recited their vows and prayers in the sacred space we created for them. What you can do is communicate with your wedding planner about creating your ceremony design as a starting point and incorporate any sacred rituals that are special to you. 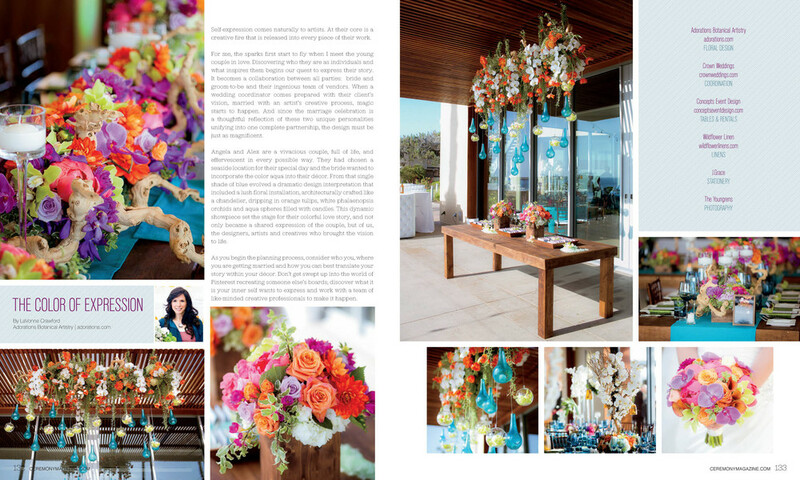 Engage your florist into designing with the intention of relocating their décor into your reception space if needed. Budget parameters can be seemingly stretched when a designer knows from the onset that the florals will be repurposed from the ceremony to the reception. Do proceed with caution in the summer months when determining your flower selection for outdoor ceremonies to be certain that the presentation and choice of flowers will translate well in hot weather. At Adorations, we are full service, providing a full day set up and delivery, from the first pinning of the boutonnieres to the very last candle lit. Your wedding is a joyous day – that moment when you are joined in marriage and commit to a partnership for life. Do not take the ritual of the ceremony lightly and consider that these vows will forever be remembered long after the champagne toasts at your reception.